It never gets old. The reaction of dogs that see their pet parents for the first time after coming home from military service is something that brings tears to our eyes —no matter how many times we witness it. These videos are proof of how much dogs love their people. YouTube user Rachel Burich uploaded a heartwarming video of her dog welcoming home her husband after returning from a nine-month-long deployment in Kuwait. 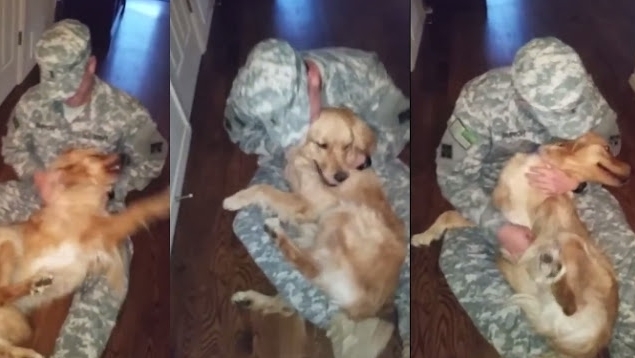 The bounding two-year-old Golden Retriever named Izzy rushes to the door and rolls around and jumps with excitement as the soldier says hello for the first time in nearly a year. The dog’s cries of joy are audible as the soldier pets and rubs Izzy’s belly and hugs his canine companion close. When the soldier stops petting Izzy for a moment, the dog practically jumps back into his arms. After spending a good minute cuddling, Izzy goes and grabs her ball and brings it over to the soldier. This sweet girl just wants to play fetch with her heroic dog dad now that he is back at home! Responses to "Golden Retriever Cries With Joy When Welcoming Soldier Home"